Automata Formula – $950 Per Hour! Automata Formula is a new automated binary options trading software by George Coleman. 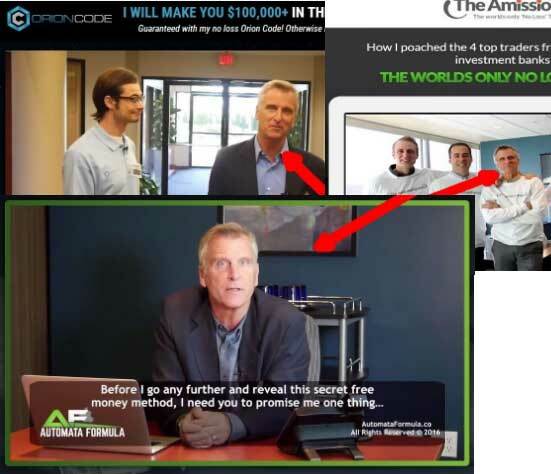 Coleman tells us that he is a former Wells Fargo trader that created a trading system that can generate you $950 per hour. The software takes no skill whatsoever and is being given away for free as long as you deposit with their recommended brokerage. Today I’ll be providing a quick review and letting you know if your wildest dreams can come true with this automated tool. The Automata Formula website consists of a short video and an email subscription form. The website is eerily similar to the Algo Trading Robot which came out just two days ago. The highlight around the video is a new aesthetic that is quite distinct and prevalent in both of these sales pages. Another similarity is the fact that they are both making outrageous claims about their software. As much as I would like to believe that this free binary options software is going to make me $950 an hour, I just know that it’s too good to be true. The developer of the Automata Formula is George Coleman. I figured it would be a good idea to do some research on his back story to find out what he’s all about. George claims to be a former successful Wells Fargo trader. Yet, when doing my research I found that there is a George Coleman who spent 12 years with Wells Fargo, but it’s not the person acting in the video. In fact, this actor has been used to play many roles. Such as, Edward Robinson in the Orion Code and Craig Phillips in the Amissio Formula. It’s quite clear that the people behind this new formula aren’t who they say they are. The real Coleman is not associated with this product whatsoever and his reputation is clearly being misused by a binary options product that has nothing to do with Wall Street. The most important part of every binary options trading system is the trading results. In this case, the live trading results section can be found in the members area but I don’t believe it for a second. This live trading results table is the exact same table seen in the Algo Trading Robot members area. They never show us the times in which the trades are taking place in the payouts never make sense. They show us $100 trades paying out $825. This would require 8 800% payout and there isn’t a single broker in the market that gets over 80%. It’s very clear to me that the people behind the system don’t know what they are doing, and don’t know anything about binary options. I recommend that you do your best to stay away from the Automata Formula and any other binary options product produced by this network of affiliates. This is not the type of investment we are interested in here at binary today, and we never will be. If you are looking for a real way to grow your accounts consistently than I suggest you take a close look at the Binary5 strategy. This is a real 5 minute expiry time software that provides incredible trading signals. Thanks for stopping in and please leave your comments now. 3 Responses to Automata Formula – $950 Per Hour! I watched the video I tried to register but it keeps on failing am in South Africa is the system available please help. I do not recommend this system.